The idea of making Dybbøl Banke a national park was born in 1924. 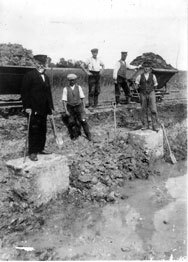 The main part of the old Danish redoubt building site was handed over to the Danish state as a gift for the Danish population in 1924. The place was earlier purchased through a national subscription. With this, the “National Park Dybbøl Redoubts” was created. In 1936 Prime Minister Th. Stauning inaugurated several monuments. The Danish redoubt building sites were visible due to marks in the grass and the ruins of the blown up concrete (powder magazine and foundation of the block house). The Danish marks were difficult to see for some guests compared to the visible and dominating German ramparts and trenches which were built after the conquest of Dybbøl (Festung Sonderburg-Düppel 1865-85). Disinterment of the block house’s foundation of redoubt nr. 2. 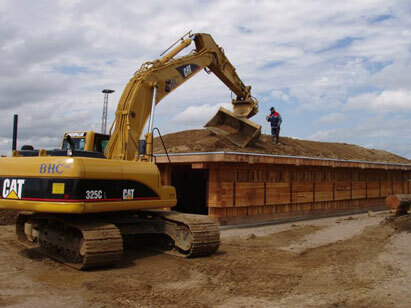 As the development gathered speed, new agrarian constructions were about to be built. Hereby, the overview about the battle field would have gotten lost. Fortunately, it was possible to protect about 250 ha during the 1920s and 1930s. Disinterment of the block house’s foundation of redoubt nr. 8. Another landscape protection issue in 1974 dealt with the further protection of 820 ha. Later on, it was stated: “Protection was needed. This protection needed to go beyond the usual protection. It was not about preserving the current landscape’s condition; it was more about finding a suitable terrain for the readjustment of the old battle field of 1864” (Preservation board of the Department of Environment). It was not only about preserving the landscape but also about changes to be able to explain better. This was included in the Preservation Board’s final preservation ruling on 23 November 1987. The agrarian properties and buildings were bought up as the opportunity arose, and improvements for the public traffic were made. The extent of the protected landscape. 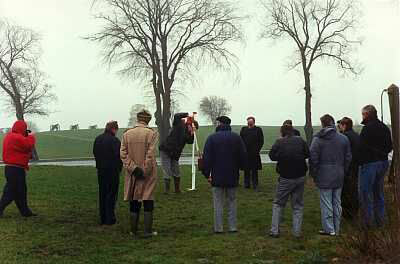 In the 1980s a local demand for a reconstruction of a Danish redoubt came up – preferably redoubt nr 2. 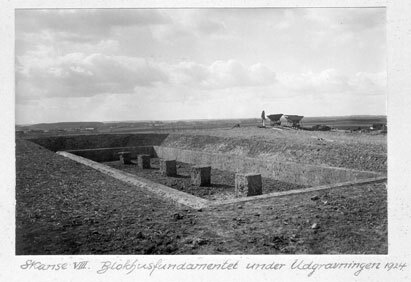 The building of a system on one of the ten Danish redoubts remains was abandoned because it was feared that guests would believe that they would stand opposite of the real property. The planning of how to create a better experience of the landscape’s history was done in a special committee – the Dybbøl-Committee. The committee included representatives of the state, the county, the municipality, the Museum Sønderborg Castle and others. Inspired by foreign visitor centers it was decided to construct an institution to enlighten and inform. The Aage V. Jensens Foundation confirmed the funding of an architectural competition and the History Centre. Construction and furnishing of the History Centre were financed by a donation of almost 23 million Danish kroner. 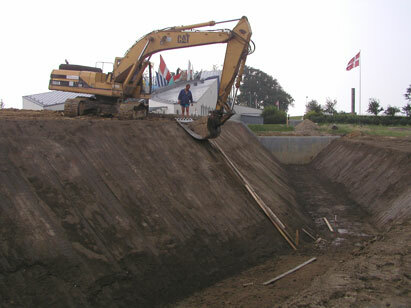 The Foundation Dybbøl Banke was responsible for the installation order and the operation. Chairman was always the current mayor of the district Southern Jutland. The furnishing and the content were created after the Dybbøl committee’s guidelines. The only exception was the construction of an open air room with direct activities with particular topics. The suggested building was acknowledged by the landscape protection committee in harmony with the landscape protection goals even though the chosen house had been absolutely unconventional and loaded with symbols. The house was designed by the winner of the architectural competition with almost 200 suggestions. The former mayor of the district Southern Jutland Chresten Philipsen started the ground-breaking ceremony for the History Centre Dybbøl Banke on 2 April 1991. 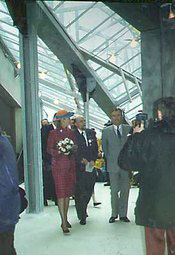 Her Majesty Queen Margrethe II inaugurates the History Centre on 18 April 1992. On her right, the Head of Centre Hans-Ole Hansen can be seen followed by His Royal Highness Prince Henrik. The History Centre’s superficial task was to help the guests to find the faint track of the Danish redoubts as well as to understand the various national historical symbols. Furthermore, an insight into the cultural environment and the cultural heritage in and around Dybbøl should be provided. Theoretically, a visitor centre is an impartation facility which once sets a focus which is then not going to be changed or further developed. Seen in a national manner, Dybbøl Banke is both a place loaded with symbols for Danes and Germans and a place to think about war and peace on a historical battle field. Besides, it tells the story with such a dynamic. This contradicts the principle of a visitor centre. With modern enlightenment means and in harmony with the modern, experience oriented impartation business, a desire was voiced: The Dybbøl stories should be strengthened. Also on a national level, it was wished to have an impartation of knowledge which goes beyond the general responsibility of a visitor centre. Hereby, payment was not an issue. This is how the modern (and never seen before) enlightenment business after the inauguration in 1992 developed. In 1994 the Head of Centre and Foundation’s consultant H.H. Holden Jensen presented plans for a reconstructed redoubt system which should lead to the History Centre’s east façade – this was an essential extension of the yard which was used for outdoor activities. It was aimed to provide a better understanding of the ten redoubts’ building places and the furnishing of 1964. First and foremost, visitors should be able to distinguish between the Danish system and the German 1865-system. The focus lay on the king’s redoubt which is mistakenly considered to be Danish and not German. Moreover, the system should illustrate the historical conditions for the soldiers during the war 1864 at the front and during the periods of rests. The primary plan was extended in the following years and included then also a subsurface system. This should include the story “The Times that followed” about the history Schleswig’s from 1864 to 1920 including the role of the Jutlanders in the First World War. In 1999 the Foundation Dybbøl Banke accepted the draft of “The strengthened Dybbøl stories” under the condition that it was going to be financed through donations from private foundations. The project was divided into three phases and should cost around 40 million Danish kroner. District and municipality were cooperative regarding the paying of the value added tax of the system’s costs. A huge public debate arose in 2000 when the project’s extent was announced. The debate had a positive impact on the draft and the loose thoughts the Head of Centre had about the future. Critics, especially historians from Southern Jutland, had the feeling that they were not involved at all. The Head of Centre Hans-Ole Hansen felt the drive for an insightful dialogue. 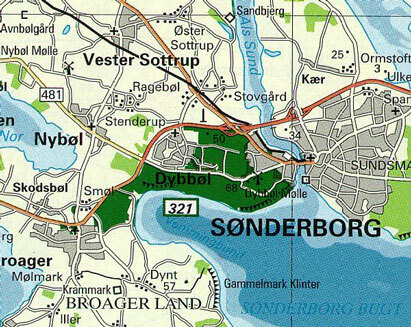 On 6 March 2001 the first phase of a regional plan was acknowledged by the Sønderborg city council. The first phase included the construction of parts of a Danish redoubt. This happened due to the approval of the landscape protection committee and because the Foundation Dybbøl Banke decided to stop phase two and three for now. 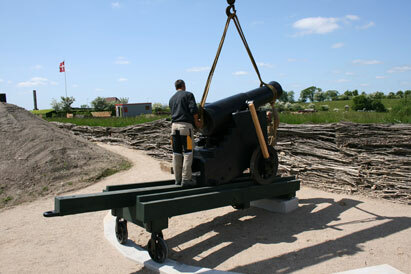 On 18 April 2003 the first part of the redoubt – rampart, moat including stockade and the first reconstructed field cannon- could be inaugurated. The second part – block house, rolling bridge, two powder magazines out of concrete and the barrack camp in the soldiers’ town – were realized between 2005 and 2007. The new block house is covered with earth. The 2.2 tons heavy cannon barrel is mounted. The History Centre’s mission was to display an important subject for society – peace and war in the borderland around Schleswig- and to make it possible to understand this on the basis of the region’s past. The History Centre’s extension from 2001 to 2007 ensured that this mission got the necessary physical frames. The background of the war 1864, its influence and its consequences are communicated in a popular-historical and a technical responsible manner. Her Majesty Queen Margrethe II intersects the cord to the new facility. Today, the History Centre has about 50 000 annual guests and the homepage www.1864.dk has 200 000 visitors. The History Centre is listed as one of currently 14 pedagogical, transfer imparting activity centers which are supported by the ministry of education and cultural affairs. The History Centre Dybbøl Banke is not a museum but a “story-telling-house” which works a lot for its revenues. Since 2005 the History Centre also takes care of the Dybbøl Mill’s daily running. The History Centre continues to belong to the Foundation Dybbøl Banke which had been responsible for the construction of the Centre. It also takes care of the pedagogical, transfer imparting activities.